Requesting READ_EXTERNAL_STORAGE or WRITE_EXTERNAL_STORAGE in your manifest allows access to all public directories on external storage, which might be more access than what your app needs. 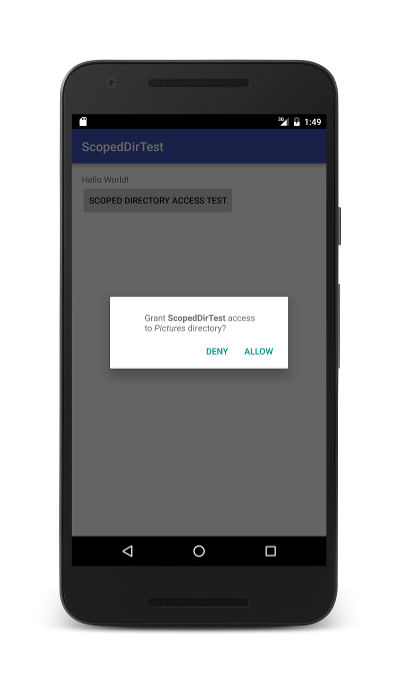 Using the Storage Access Framework usually makes your user pick directories via a system UI, which is unnecessary if your app always accesses the same external directory. Android 7.0 provides a simplified API to access common external storage directories. Use the StorageManager class to get the appropriate StorageVolume instance. Then, create an intent by calling the StorageVolume.createAccessIntent() method of that instance. Use this intent to access external storage directories. To get a list of all available volumes, including removable media volumes, use StorageManager.getStorageVolumes(). If you have information about a specific file, use StorageManager.getStorageVolume(File) to get the StorageVolume that contains the file. Call createAccessIntent() on this StorageVolume to access the external storage directory for the file. On secondary volumes, such as external SD cards, pass in null when calling createAccessIntent() to request access to the entire volume, instead of a specific directory. createAccessIntent() returns null if you pass in null to the primary volume, or if you pass in an invalid directory name. Figure 1. An application requesting access to the Pictures directory. If the user grants access, the system calls your onActivityResult() override with a result code of RESULT_OK, and intent data that contains the URI. Use the provided URI to access directory information, similar to using URIs returned by the Storage Access Framework. If the user doesn't grant access, the system calls your onActivityResult() override with a result code of RESULT_CANCELED, and null intent data. Getting access to a specific external directory also gains access to subdirectories within that directory. Where possible, persist the external directory access URI so you don't have to repeatedly ask the user for access. Once the user has granted access, call getContentResolver() and with the returned ContentResolver call takePersistableUriPermission() with the directory access URI. The system will persist the URI and subsequent access requests will return RESULT_OK and not show confirmation UI to the user. Figure 1. An application making a second request for access to removable media. If the user selects Don't ask again and denies the request, all future requests for the given directory from your app will be automatically denied, and no request UI will be presented to the user.